FALMOUTH, England (Reuters) - Can robots be creative? British gallery owner Aidan Meller hopes to go some way towards answering that question with Ai-Da, who her makers say will be able to draw people from sight with a pencil in her bionic hand. Meller is overseeing the final stages of her construction by engineers at Cornwall-based Engineered Arts. He calls Ai-Da - named after British mathematician and computer pioneer Ada Lovelace - the world's first "AI ultra-realistic robot artist", and his ambition is for her to perform like her human equivalents. "She's going to actually be drawing and we're hoping to then build technology for her to paint," Meller said after seeing Ai-Da's prosthetic head being carefully brought to life by specialists individually attaching hairs to form her eyebrows. "But also as a performance artist she'll be able to engage with audiences and actually get messages across; asking those questions about technology today." Her skeletal robotic head may stand disembodied on a workbench, but her movements are very much alive. Cameras in each of her eyeballs recognize human features - she will make eye contact and follow you around the room, opening and closing her mouth as you do. Get too close and she'll back away, blinking, as if in shock. Ai-Da's makers say she will have a "RoboThespian" body with expressive movements and she will talk and answer questions. "There's AI (artificial intelligence) running in the computer vision that allows the robot to track faces to recognize facial features and to mimic your expression," said Marcus Hold, Design & Production Engineer at Engineered Arts. 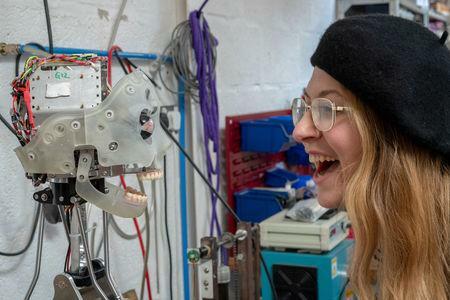 Ai-Da's makers are using "Mesmer" life-like robot technology for her head, and once finished she will have a mixed race appearance with long dark hair, silicone skin and 3D printed teeth and gums. "(Mesmer) brings together the development of software mechanics and electronics to produce a lifelike face with lifelike gestures in a small human sized package," Hold said. Ai-Da will present her inaugural exhibition "Unsecured Futures" in May at the University of Oxford, and her sketches will go on display in London in November.